We all know that Patak's Pastes create authentic and flavourful curries. But did you know that they could also add a twist to your favourite dishes? See how Jamie Oliver uses Patak's Pastes to create delicious meals in minutes. 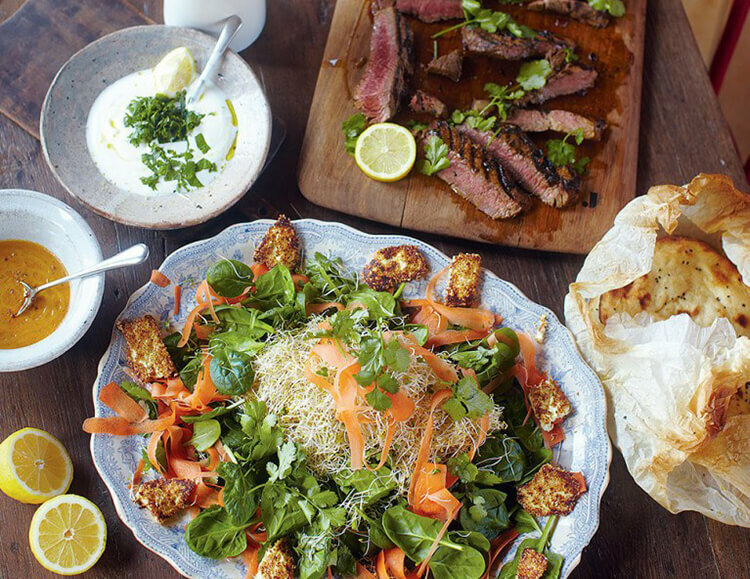 Everyone loves a good steak sandwich, but have you ever considered cooking your steak Indian Style and serving with a paneer and spinach salad and Naan instead of your traditional trimmings? In this tasty twist, Jamie Oliver has used our Jalfrezi Paste as a both marinade and the base for a tasty coconut curry sauce. Jamie Oliver's recipe for Quick salmon Tikka with cucumber yoghurt takes only 17 minutes to prepare! Turning curry on its head, Jamie serves the Tikka salmon on top of the Naan with cooling yoghurt and a cucumber salsa. Jalfrezi is a classic curry and Jamie Oliver's vegetarian variation is a great winter warmer. The recipe uses our Jalfrezi Paste as a base for a spiced vegetable stew. You can change up the veg you used based on what's in season. We recommend squash or pumpkin in the autumn months. Serve with fluffy rice and our Pappadums for a satisfying Indian meal. Having trouble getting your children to eat fish? Why not try Jamie Oliver's recipe for a mild Coley Curry. Our Korma Paste and coconut milk give the fish a delicate curry flavour. If some of your family are spice shy, you can simply leave off the sliced chilli. We hope you enjoy Jamie Oliver's Indian twists on classic favourites. Be sure share your tasty twists with us on our Facebook page.